Interested candidates must be available 2-4 evenings a week from 4-8 pm and Saturdays from 9 am-12 pm. Only candidates who meet our competency requirements will be contacted. Oxford Learning Milton has openings for upbeat, passionate, committed, enthusiastic, and dynamic teachers who want to work in a rewarding teaching environment. Our English and Math Programs (Grades 1-8) offer individual support to students looking to improve their academic skills and study habits. Interested candidates must be available from 5:00 pm to 8:00 pm at least two evenings per week and Saturday mornings. A commitment until the end of June 2019 is required. If you possess all of the above qualities, meet all the qualifications, and want to join a high energy group of educators whose goal is to see students succeed, then please email your cover letter and resume to Naghmeh Razmpoosh at milton@oxfordlearning.com. As per Ontario’s Accessible Employment Standards, Oxford Learning Milton, welcomes and encourages applications from people with disabilities. Accommodations are available on request for candidates taking part in all aspects of the selection process. Oxford Learning Academy in Milton has openings for a Primary/Junior and Junior/Intermediate Supply Teachers to teach classes of approximately 12 students between grades 1-8 for 2017-2018 school year. There are five classrooms: JK-SK, Grade1-2, Grade 3-4, Grade 5-6, and Grade 7-8. This qualified supply teacher will be responsible for the delivery of creative, comprehensive classroom lessons prepared by the present homeroom teacher, any day of the week from 8:30 am to 3:00 pm. Reporting to the Principal of the Oxford Learning Academy private school, you will have an extensive knowledge of grades 1-8 curriculum requirements in Ontario. The successful candidate is an enthusiastic, articulate, and creative teacher who communicates with ease and confidence. You offer a learning community that allows different learners to thrive and prosper. You are comfortable engaging in innovative and diverse individualized programming. You are a critical thinker who demonstrates initiative, integrity, and attention to detail. Oxford Learning Academy in Milton has two openings for a Primary/Junior School Teacher to teach a class of approximately 12 students in grades 3-4 for 2018-2019 school year. These qualified teachers need to begin training as soon as possible in order to teach their class in September. These teachers will be responsible for the development and delivery of creative, innovative and comprehensive classroom programming Monday to Friday from 8:30 am to 3:00 pm. Reporting to the Principal of the Oxford Learning Academy private school, you will have an extensive knowledge of grades 3-4 curriculum requirements in Ontario. You have Primary/Junior qualifications. You will have experience working with diverse groups of learners, having approximately 12 students in one class ranging from grades 3-4. The successful candidates will be eligible for teacher benefits for themselves and their family members, including medical, dental and vision coverage after the successful completion of the probationary period. Based on our school’s timetabled teaching week, a homeroom teacher that completes one school year successfully will receive an FTE (Full-Time Equivalent) of 1.00 unit reported to the board of education. The successful candidates are enthusiastic, articulate and creative teachers who communicate with ease and confidence. You offer a learning community that allows different learners to thrive and prosper. You are comfortable engaging in innovative and diverse individualized programming. You are a critical thinker who demonstrates initiative, integrity and attention to detail. Our son began the Little Readers’ Program at Oxford Learning Milton in 2014 and he loved it. He started out with morning sessions and gradually moved to full time by early 2016. It has truly been a learning haven. There he quickly learned how to interact with his teacher, classmates and others. Most importantly he mastered reading and other subjects under the careful guidance of his teachers and the principal. The staff is extremely warm, kind and fun; our son was very comfortable with them. The facility itself is of the highest standard. There are many aspects to what the school offers - addressing each child’s academic and social skills at an early age. The school’s festival of the arts, movie nights and annual graduations have year on year left memorable episodes of the students’ outstanding accomplishments in our minds. We could rave on and on about Oxford Learning Milton but invite prospective parents and children to visit and get more information first-hand. Our family readily attest to the tag-line that Oxford Learning Milton is not just a school; it is indeed a “caring” community. Thanks so much for establishing the foundation for our son. My son was having a hard time in Kindergarten and seemed to be getting lost in the shuffle. We came to Oxford Learning Centre concerned that he was going to struggle going into grade one and may ultimately become so discouraged he would not enjoy going to school. He was immediately enrolled in the Little Readers Program and after the first couple of weeks we noticed a huge difference. He is so much more engaged in his class room and also more confident knowing all the things he has learned. He is excited to go to school and repeats things he has learned in class that amaze our family. He has been in the program now for a while and continuing to excel and a pace faster than we experienced in his kindergarten class. His Kindergarten teacher has also commented on how far he has come and how amazing the transformation has been. He still has a ways to go but I know with the caring staff and teachers at Oxford Learning he will continue to excel. My only regret with The Little Readers Program is that we waited so long to enrol our son. A.S.
We are excited to have your child join our full-day academic program Oxford Learning Academy where your child will experience a homeschooling approach with the benefits of socialization in a small classroom environment. The Oxford Learning Half-Day Summer Little Readers® Camps run for six individual weeks in the mornings. Students can choose any two weeks or more to attend. This allows you to arrange your Little Readers® Camps around holidays, other camps, and activities. The Little Readers® Camp includes two hours of academics, ten minutes of healthy snacks (fresh fruits) and 20 minutes of fun, educational, camp-themed activities. The Oxford Learning Half-Day Summer Camps run for six weeks, between July 8 to August 2, and August 12 to August 23, in the mornings, from 9:00 am to 11:30 am. Camp curriculum includes English, Math, French, Creative writing, Paragraph & Essay Writing, and/or Study Skills. Brain Camp students will spend time on individual academic programs and in group activities. Students who are at grade level can work on next grade level material and be ahead of their class in September. Students who are below grade level can work on catching up over the summer and be more confident in their academics in the fall. Students can choose any number of days in the week to attend, have fun, and keep their brains active at the same time. This flexible scheduling should allow you to arrange your Brain Camp classes around your holiday times and other camps and activities. The Oxford Learning Full-Day Summer Camps run from July 8 to August 2 and August 12 to August 23 from 9:00 am to 3:00 pm. Camp curriculum includes English, Math, French, Creative Writing, Paragraph & Essay Writing, and Study Skills. The Summer Learning Program runs from July 2 to August 23, Monday to Thursday from 4:00 pm to 8:00 pm. This program can be developed on request with the purchase of a minimum of 20 hours. Programs include High School Preparation, Math, French, Paragraph & Essay Writing, Novel Studies, Study Skills, University Preparation, and Creative Writing. The Academic Diagnostic Assessment is mandatory. To learn more about Milton tutors, contact Oxford Learning® today! Milton is home to Oxford Learning®, a top-of-the-line tutoring service with tutors who combine learning styles and effective teaching methods to help students develop learning skills that last. Whether a child is looking to catch up or get ahead, our tutors guide students to their full potential. Our Milton tutors provide expert tutoring to students, allowing your child to develop strong habits that will benefit him or her beyond the doors of the classroom. 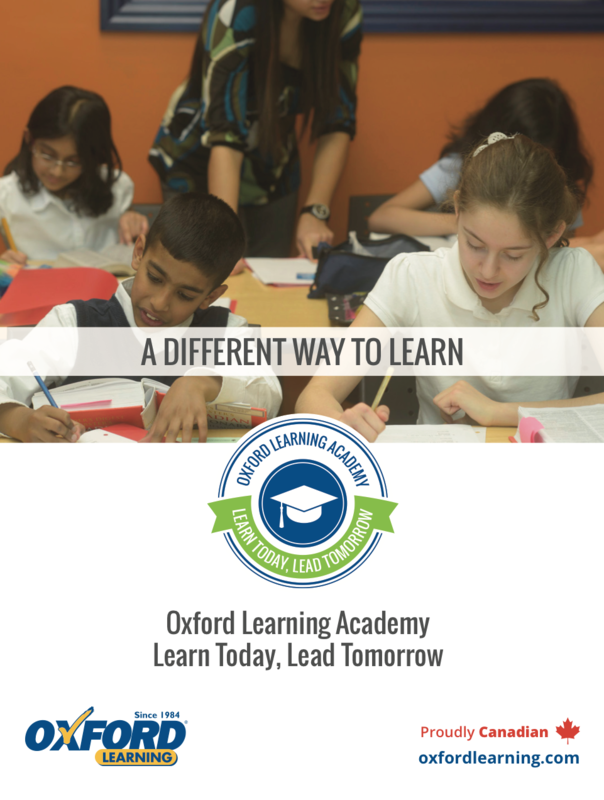 Oxford Learning® caters to a variety of subjects and educational needs, including Math, Science, English, French, study skills and more! The tutors at Oxford Learning® welcome students from Milton and surrounding areas, including Boyne, Haltonville, Campbellville, Brookeville, Wilmott.